Pub crawls are an excellent way to get a group of friends together for a night of fun and adventures. With Vegas Pub Crawler you will be able to explore all the great bars and restaurants that Downtown Las Vegas has to offer. All over the world, cities host large pub crawling events that allow groups to dress up and explore their locals bars. Here are five famous pub crawls from all over the world. A spin-off of The Tour de France, each member of the bar crawl cruises down the Pacific Ocean in Santa Monica, California making their way to Hermosa Beach. Along the way, everyone will get the opportunity to stop and enjoy some drinks and food at the many bars and eateries. You are welcome to dress up and deck out your bikes in whatever theme you would like. If you do not own a bike, there are bike rentals at the beginning of the tour. Around Christmas, many cities host some sort of Santa-themed pub crawl, but the biggest event in the world is held in Australia. What started out as a small tradition has now expanded to host over 6,000 people each year. Everyone dresses up as their version of Santa and makes their way through the many pubs in the area. The proceeds of the event are then donated to the charity chosen for the year. This is definitely no children’s game. In London, everyone is invited to try out the Monopoly Board Pub Crawl. In order to complete the board, you must make your way to all 26 locations. You do not have to have a drink at each location, but the top honors and recognition go to the ones who can successfully complete this task. Nothing is better than poutine with a nice cold pint. On the Montreal Pub Crawl, you’ll visit four different venues and receive a complimentary shot and beer at each location. You will also be able to skip all the lines and cover charges. The perks of being one of the cool kids. Pub crawls are an excellent way to view the heart of the city you are in and make some new friends. 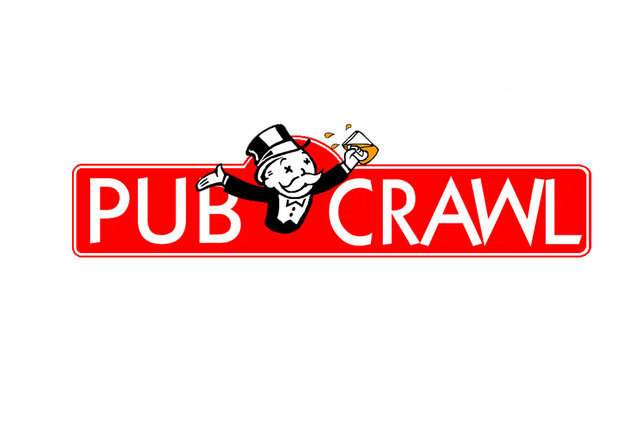 Vegas Pub Crawler takes you on the most epic pub crawl of Downtown Las Vegas. Cruise the streets in style on our fifteen person pub cycle. Visit our website today to book your next Las Vegas pub crawl.